A few years ago we were traveling through South Carolina and found a Le Creuset factory store! I bought crocks in a lovely shade of purple with the intent of making French onion soup. I finally got to use them with this recipe. 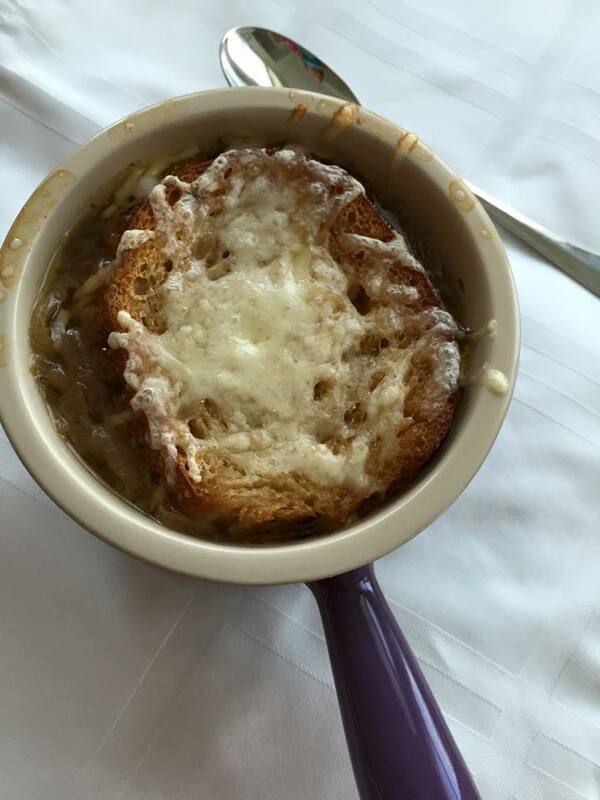 It’s week 2 of the 52 Week New Recipe Challenge and I tried a new French onion soup recipe from a cookbook in my collection, The Good Housekeeping Cookbook – Sunday Dinner Collector’s Edition. The weather here in Florida got chilly so I seized the opportunity to make soup. I’ve made a few French onion soup recipes in the past but this one will go into my recipe box. It is necessary to have oven-proof bowls so you can melt the cheese. Of course, I use only the best Vidalia onions when they are available in my grocery store. French onion soup takes time to make. Patience is key. If you want it for lunch, and want to eat at 12:30, don’t start cooking at noon! Plan for a little longer than 2 hours, prep and cook time, with this recipe. In a non-stick, 12-inch skillet, melt butter over medium-low heat. Add onions, salt and cook, stirring occasionally, until onions are very tender and begin to caramelize, about 45 minutes. Reduce heat to low and cook, stirring frequently, until onions are deep golden brown, about 15 minutes longer. Transfer onions to 5 quart Dutch oven. Add 1/2 cup water to same skillet and heat to boiling, stirring until browned bits are loosened from bottom of skillet. Add to onions in Dutch oven. Add remaining 3 1/2 cups water, broth and thyme to onions and heat to boiling over high heat. Reduce heat and simmer 30 minutes. Preheat oven to 400 degrees F. Arrange bread slices on cookie sheet and bake until lightly toasted, about 5 minutes. Place four ovenproof bowls in jelly roll pan for easier handling. Spoon soup evenly into bowls and top with toasted bread, slightly pressing bread into soup. Sprinkle shredded cheese (Gruyère or Swiss) evenly on top. Bake until cheese has melted and begins to brown, 12 to 15 minutes. Makes about 5 cups or 4 first course servings. This entry was posted in 52 Week Challenge, Appetizers, Comfort Food, Soups and tagged beef broth, cold weather recipes, Comfort Food, French bread, French onion soup, French onion soup recipe, Gruyere cheese, onions, soup, Swiss cheese, thyme, Vidalia onions. Bookmark the permalink.